1. Time for a Santa Claus rally? 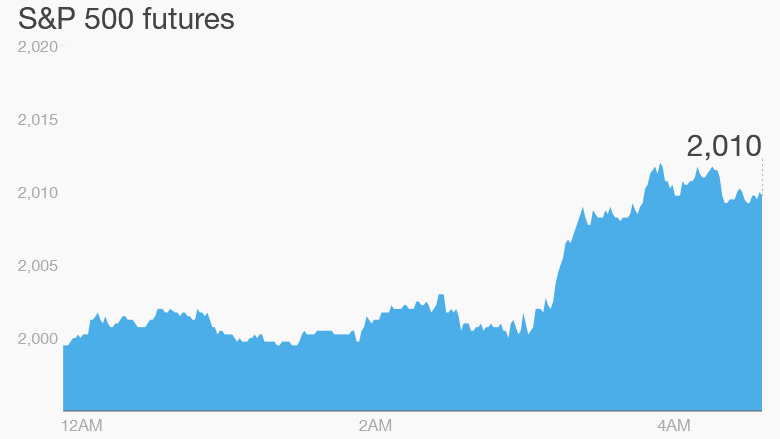 : U.S. stock futures are pointing to a higher open Monday after markets suffered a steep drop on Friday. The Dow Jones industrial average fell by 2.1% on Friday, the S&P 500 retreated 1.8% and the Nasdaq lost 1.6%. All three indexes are currently in the red for December, countering seasonal expectations for a "Santa Claus rally." Most European markets are also rising in early trading, while Asian markets ended with mixed results. 2. Pain in Spain: The key Spanish IBEX 35 index is down by about 2% on Monday after a general election on Sunday resulted in more political uncertainty. The euro was also under pressure as the election results came through. Spain's ruling conservative party walked away with the most seats in the election, but fell short of winning a clear majority. The party, led by Prime Minister Mariano Rajoy, won 123 seats. It needed 176 seats for a majority. The Socialist Party followed in second place and claimed 90 seats. 3. Stock market movers -- Disney, Apple, Ericsson, Toshiba: Shares in Disney are rising by about 2% premarket after its movie -- "Star Wars: The Force Awakens" -- had the biggest opening in box office history. It brought in an estimated $238 million in the U.S. this weekend, surpassing the record held by Universal's "Jurassic World," which made $208.8 million on its opening weekend in June. The new 'Star Wars' film has made $517 million around the world since opening overseas on Wednesday. Shares in Apple (AAPL) and Ericsson (ERIC) are jumping premarket after the two firms signed a patent-sharing deal that resolves ongoing infringement claims. Ericsson shares were up 7% while Apple advanced 1.5%. Shares in Toshiba (TOSYY) dropped by about 10% on Monday after the Japanese company said it expects to post a $4.5 billion loss this year as it deals with the aftermath of a massive accounting scandal. The estimated loss is significantly higher than analysts had expected.